We’d love your help. Let us know what’s wrong with this preview of Losing Kate by Kylie Kaden. I'm the most authentic version of myself when I'm around Jack. We've known each other since we were kids, and our relationship was always one of mudpies and mocking. Beautiful Ka This mesmerising debut is part love story, part mystery, telling the captivating story of two lovers torn apart by tragedy and the secrets they kept of one devastating night. Beautiful Kate, my best friend, disappeared on a moonlit beach after Jack dumped her for me. Jack was a suspect and, sure of his innocence, I lied to protect him. I know Jack didn't kill her. Our betrayal did. Thirteen years later, I am thirty, childless and single, attempting to renovate my life rescuing a rundown worker's cottage. All is as it should be in my safe little world – until Jack buys the vacant lot behind my house… and the feelings that we buried all those years ago – the guilt, the love and the pain - resurface. To ask other readers questions about Losing Kate, please sign up. Jack and Frankie (Francesca)'s mothers were friends and so the two kids grew up together, played and tumbled together like puppies and were best mates at school. Into their final year walk school walked Kate, a beautiful charismatic girl who became both Frankie's best friend and Jack's girlfriend. Frankie has coped with Jack having girlfriends before, but not her best friend and their triangle becomes a bit strained at times. Then tragedy strikes at a beach camp following their end of year exams Jack and Frankie (Francesca)'s mothers were friends and so the two kids grew up together, played and tumbled together like puppies and were best mates at school. Into their final year walk school walked Kate, a beautiful charismatic girl who became both Frankie's best friend and Jack's girlfriend. Frankie has coped with Jack having girlfriends before, but not her best friend and their triangle becomes a bit strained at times. Then tragedy strikes at a beach camp following their end of year exams and Frankie loses not only Kate but also Jack. The book opens some 13y later with 30y old Frankie fixing up a derelict cottage that she bought. When the block next door is up for sale, who should walk back into her life but Jack. Soon he and his partner and little boy are installed next door and Frankie must face up to what really happened all those years ago. Francesca (Frankie) is single, aged thirty and lives alone in her run down cottage which she is trying to renovate in between her work schedule. The vacant land at the back of her cottage is up for sale, so on auction day, Frankie and her friend, Meg go along to see if the land gets sold, but the last person, Frankie expected to see in the crowd was, Jack. Frankie and Jack were childhood friends who attended the same school and it's been thirteen years since they've seen one another. After, Jack Francesca (Frankie) is single, aged thirty and lives alone in her run down cottage which she is trying to renovate in between her work schedule. The vacant land at the back of her cottage is up for sale, so on auction day, Frankie and her friend, Meg go along to see if the land gets sold, but the last person, Frankie expected to see in the crowd was, Jack. Frankie and Jack were childhood friends who attended the same school and it's been thirteen years since they've seen one another. After, Jack's partner became the highest bidder it seems they were about to become neighbors. Seeing Jack again only brings back terrible memories from their teenage years. Schoolies weekend on the beach is one weekend that, Frankie will never forget. This was the time when their friend, Kate disappeared without a trace. Both Frankie and Jack were distraught over the disappearance of their friend, but neither of them knew where she was or what had happened her. Frankie had feelings for Jack all those years ago, but she knew that she could never act on them whilst, Kate and Jack were going out with one another. Is it possible that those feelings are still there and what did happen to Kate? Kylie Kaden's compelling debut novel, Losing Kate, is an absorbing contemporary story of secrets, betrayal, love and redemption. On the night that seventeen year old Kate disappeared while celebrating 'schoolies', Francesca lost both the best friend she adored and the boy, Jack, who held her heart. Thirteen years later, Frankie is stunned to discover Jack has bought the vacant block of land bordering her cottage. Their unexpected reunion revives memories and emotions neither are prepared for, and to move forward they need to learn the truth about what happened to the girl they both loved. The first person narrative shifts between the past and present as it traces Jack, Kate's and Frankie's teenage relationship, the events on the night Kate went missing, and Frankie's and Jack's reunion after 13 years. Though Frankie and Jack quickly reestablish the intimacy of their childhood friendship, Kate always stands between them. Guilt, regret and lies are irredeemably tangled with loyalty, truth and love. The situation is complicated further by Jack's current relationship. The mystery of Kate's fate is what primarily drives the tension throughout the novel. The flashbacks slowly reveal what Frankie remembers of the night and how those memories fit with what she is learning in the present day. Frankie just can't let go of Kate and her desire for closure. Suspicions rise and fall as the truth is pieced together, and the swirling ambiguity kept me guessing. Despite the pop culture references (to bands like Powder Finger), elements of the story, including the oppressive summer weather, Francesca's crumbling cottage, fire and illness, give the story a contemporary gothic feel. The doomed teenage romance between Kate and Jack also plays into this, as does Frankie and Jack's unrequited love. Set amongst the streets of suburban Queensland, Losing Kate is a gripping novel of suspense, drama and romance. An impressive debut, I really enjoyed Losing Kate and I'm looking forward to more from Kylie Kaden. As Frankie gazed at the huddle of people in her back yard, she felt a little bemused – her little old miner’s cottage which she had bought earlier with the view to renovate had a vacant block at the back, just beyond the rickety fence – this was why the group of people, including the forceful auctioneer were on her property. Her neighbour and best friend, Meg, was treating it as a fun day for her boys – including the popcorn. But quite suddenly Frankie froze in shock; a man from her long ago pas As Frankie gazed at the huddle of people in her back yard, she felt a little bemused – her little old miner’s cottage which she had bought earlier with the view to renovate had a vacant block at the back, just beyond the rickety fence – this was why the group of people, including the forceful auctioneer were on her property. Her neighbour and best friend, Meg, was treating it as a fun day for her boys – including the popcorn. But quite suddenly Frankie froze in shock; a man from her long ago past had just materialized – her emotions went into overdrive immediately as memories crashed over her. Thirteen years ago two childhood friends found their lives ripped apart by tragic events – events which occurred at a schoolies weekend on the beach. They had escaped the restrictions of their families finally, and were all set to have a fantastic weekend, drinking, fishing and just being teenagers. Kate and Frankie were best friends; Kate had been in Frankie’s life for only a year, but it felt like she had known her forever. Jack she HAD known forever – since they were little kids they’d been best mates, but as Frankie had matured her feelings for Jack had intensified. But Kate and Jack were an item, so she continually felt like “the third wheel”. All these years later and recently single after kicking out an unfaithful fiancé, Frankie watched the auction come to its conclusion; she realized with a dawning sense of dread that Jack was the final bidder. How would she cope with the man who knew so much about her past – their past – living almost on her doorstep? All the guilt, remorse and pain was resurfacing – were there secrets which would come to light? Would they ever get over losing Kate? What a great story! A debut from Aussie author Kylie Kaden, I feel confident in saying she is here to stay. The mystery was well done with an authentic twist at the end, also the moving from past to current day worked really well. I have no hesitation in recommending this novel highly. With thanks to NetGalley for my copy to read and review. A rich evocative read that kept me riveted right to the end. Losing Kate is a stunning debut and I look forward to reading many more stories from this wonderful new writer. You can read this and my other reviews at My Written Romance. I was provided with an ARC of this book via NetGalley in exchange for an honest review. We hear the tale of Kate and the impact her loss had on those who loved and knew her through the eyes of Frankie. Frankie and Jack were never apart as children, the very best of friends. Then Kate arrived in their lives, a whirlwind who blew in and changed it in more ways than she could ever know. Frankie watched from the sidelines, trying t You can read this and my other reviews at My Written Romance. Frankie and Jack were never apart as children, the very best of friends. Then Kate arrived in their lives, a whirlwind who blew in and changed it in more ways than she could ever know. Frankie watched from the sidelines, trying to ignore a rising sense of jealousy in seeing her friends get together. But in their world, nothing was what it appeared to be on the surface, and on a camping trip one weekend, everything changed. The pace of the story was fast without being dizzying, told in a mixture of present day and flashbacks. Sometimes, the back and forth approach to storytelling can throw me out, however not so in this case. The glimpses of the past made it possible for me to understand the motivations of Frankie and Jack in the present world. The connection between Frankie and Jack is electric. Even with the external difficulties (Jack has a partner and child) and the memories of Kate that are ever-present, I could see that there was meant to be something more than simply friendship between them. I did find myself wondering how Kylie Kaden would resolve their relationship without it descending into a cheating book, and how it is done is definitely satisfying. I saw aspects of the character Kate that remind me of particular people that I've known throughout my life. The suspense and mystery surrounding Kate's disappearance is really well done. I have to say I was not expecting the outcome to be what it was - and I loved that. Being kept guessing without being totally confused as to what happened - that's my romantic suspense catnip right there. Brilliant storytelling. Hard to believe this is a debut novel. It takes talent to write a story that shifts back and forth (decades) and do it so well. I feel like I actually ‘watched’ Frankie and Jack growing up into the present day adults who reconnect and rediscover the tragic event from their angsty teenage years. The wonderful turn of phrase made Losing Kate a delightful and easy read. I look forward to the next novel. Thirteen years later Francesca, single and working a gruelling job as a social worker, has stayed in her hometown and bought a fixer-upper cottage next door to a house on vacant swamp land. But the day that land goes up fo Thirteen years ago Francesca’s best friend died under mysterious circumstances. Kate’s death made the papers, and suspicion was cast on her boyfriend, Francesca’s best childhood friend, Jack Shaw … so much doubt was cast, and mud sticks, so Jack and his family had to move away. I feel like I'm at a school reunion, my life being evaluated by the person who I started becoming a person with. We've lapsed into that small talk again, and I relax in a way I've only ever been able to with him. There's so much about the last thirteen years I don't know. Has he missed me? Has he missed Kate? Has he made his peace with what happened on that beach when we were seventeen, desperately trying to be grown up in an adult world? I really enjoyed this book, even while not particularly liking many of the characters in it. Kaden’s female characters are particularly hard to read– mainly Kate and Sara. Sara, I think, is somewhat shaded by Francesca’s view of her – she seems larger than life in her bitchiness, and could almost be the villain of the story … if not for the fact that I was always aware that I was reading her through Francesca’s eyes, with her jealousies over Jack and likewise Sara’s (correct) suspicions about the two of them. Kate, in flashback, reminded me (hauntingly) of Kate Kendall in Rachel Ward’s film ‘Beautiful Kate’ – a young woman whose beauty and confidence belies deep demons that continue to haunt all those she touched. Thirteen years ago, Frankie, Jack and Kate were almost inseparable. Frankie and Jack had been friends since they were both tiny – Frankie’s mother used to babysit Jack after his mother went back to work. They went through school together like best friends although somewhere along the way, things became a little different. Kate was new to the school when they were about 16 and it was Frankie she made a beeline for and the two of them became best friends. Shortly after, Jack the Thirteen years ago, Frankie, Jack and Kate were almost inseparable. Frankie and Jack had been friends since they were both tiny – Frankie’s mother used to babysit Jack after his mother went back to work. They went through school together like best friends although somewhere along the way, things became a little different. Kate was new to the school when they were about 16 and it was Frankie she made a beeline for and the two of them became best friends. Shortly after, Jack the jock and Kate, beautiful Kate, became an item and Frankie was in the middle of a very delicate juggling act. Kate was needy, often difficult but the two of them were as close as sisters, even though Kate occasionally would feel left out of Frankie and Jack’s closeness. And Kate hated feeling left out. When they finished school, they went camping on a ‘schoolies’ holiday and Kate disappeared after Jack tired of her drama and broke up with her, determined to move on with Frankie, the one he should’ve been with. However nothing was ever the same after Kate’s disappearance – Jack was briefly a suspect and then he moved away to escape the stares and the whispers. Now Frankie is nearly 30, unmarried and not connected to anyone when Jack buys the property behind hers. All of a sudden, everything Frankie has been suppressing – guilt, pain and so much more comes rushing to the surface. She and Jack have always been better together but there are complications. Jack has a ready-made family but as always, the two of them are drawn together. They want to be around each other but they still have so much unfinished business. In order to move on, move forward either together or separate, they have to know what happened to Kate all of those years ago. 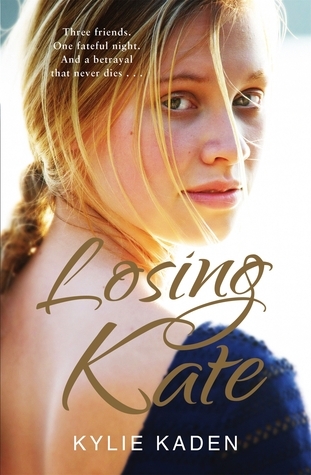 Losing Kate is the sort of story that has a little bit of everything. On one hand, it’s a love story – Frankie (short for Francesca) and Jack have known each other since they were tiny. They grew up together, they were best friends. Somewhere along the way they started to see each other as more than friends but were reluctant (especially Frankie) to take that next step for fear of ruining the amazing friendship they’d spent so many years cultivating. Enter Kate, new girl at school. Beautiful, a bit crazy and she slips straight in, becoming best friends with Frankie and Jack’s girlfriend. It’s also a mystery as thirteen years after Kate disappears, Jack pops back into her life. This brings back all of the feelings she’s crammed to the back of her mind right to front and center and she finds herself desperate to know what really happened to Kate. All Frankie knows is that Kate ran away from Jack on the beach after Jack broke up with her and was basically never seen again. Why did she feel the need to run when there was really no where safe to go? Was it an accident? Did she meet with someone who hurt her? And was what Kate told Frankie just prior to her disappearing really true? And if so, it means Jack lied to her. And if he lied to her about that, even all of those years ago, then she knows that the two of them have no future together because she’ll never be able to trust her. It’s important for Frankie to know the truth. I think that most people, well most teenage girls have had a friend like Kate. Someone that you click with, who is fun and amazing when they’re happy but who can also be difficult and moody and make you feel like you’ve done them so wrong when really you have no clue what it is you’re supposed to have done. Kaden really captures this with Frankie and Kate, perfectly balancing the fact that Frankie loves Kate, enjoys her company and being friends with the effortlessly cool girl, at the time unaware of the fact that Kate does have some underlying issues that an adult picks up on but a teenager would be oblivious to at the time. Likewise the triangle is well done, which is a difficult thing to achieve. The scenes in the past are where this book shines, navigating the difficult teenage relationships with all their complicated layers and for Frankie, trying to achieve that balance where she gets to both keep Kate as a best friend and get to be with the person she wants to be with, who clearly wants her as well. I’m about the same age as Francesca, so her teenage memories of music etc are my teenage memories of music. It was a great way to connect with Frankie and her life. In the present, nothing is easy. Jack has a partner named Sara and he deliberately hides his connection to Frankie from her for fear of raising her suspicion. It seems that Jack has a predisposition to picking women who are self-destructive and often difficult which made me wonder if he was trying to make up for what happened to Kate (or if I was just totally overthinking it and Sara was difficult because it made it easier for the reader to dislike her and want Jack and Frankie to have their chance!). Jack and Frankie have so much to work out, half truths, finding the real from the not real and the messy situation regarding Jack’s home life and it was interesting to watch them really work at it, sometimes making mistakes and taking a step backwards before they could go forwards. With a fresh, distinctive voice, Kylie Kaden describes the story of a teenaged girl who disappears on a deserted beach during an end-of-school adventure, and details the impact the event had on those left behind, namely Kate’s friends Frankie and Jack. I’m not usually a flash-back fan, but the author expertly weaves present day scenes (when Frankie and Jack meet again at thirty, thirteen years after the event), to the tense beach scenes that led to Kate’s disappearance. I usually have a few books With a fresh, distinctive voice, Kylie Kaden describes the story of a teenaged girl who disappears on a deserted beach during an end-of-school adventure, and details the impact the event had on those left behind, namely Kate’s friends Frankie and Jack. I’m not usually a flash-back fan, but the author expertly weaves present day scenes (when Frankie and Jack meet again at thirty, thirteen years after the event), to the tense beach scenes that led to Kate’s disappearance. I usually have a few books on the go, but I was compelled to keep reading this one. This is the kind of romance I like – one firmly based on reality, and modern day dilemmas. You’ll find no swooning or heart palpitations here, so if that’s your thing, stick to your traditional romance, but if you want likeable characters, a heart-felt tale, and don’t mind a bit of Aussie slang, this is an enjoyable and moving read. The pace is fast, without being bogged down on lengthy descriptions, but I warmed to the down-to-earth narrator (Frankie) with her insecurities and flaws, as she bravely renovates an old timber cottage, and comes to terms with her past and her role in Kate's fate. Losing Kate is a hybrid, cross genre read, grounded in a love story, but with the momentum generated by the mystery surrounding what really happened to Kate. I found myself forced to keep reading just to see if Frankie and Jack manage to finally get it on . A modern, emotive tail of second chances, friendship and loyalty that would particularly suit the New Adult market, but equally as enjoyable for those of us thirty-something’s who still feel like we’re fresh out of high-school (aren’t we?). Fast paced, simply written, but easy to love, this is a very promising start for the Australian author. I should disclose that I received a pre-released copy of Losing Kate through a media contact, but I was pleasantly surprised by this promising starter from Random House. A very self-assured first novel. I don't know how to begin this review. This book was compelling, mesmerising, I couldn't put it down and I totally felt for Francesca (for Fray/Frankie), Jack and even Kate. It begins in Year 12, Frankie and Jack have been best friends since early childhood and Kate comes to the school as the new girl. They strike a friendship and Kate is everything that Frankie wants to be, striking, confident and exciting...and she also has Jack, to the point that Frankie often feels on the outer. Kate disappear I don't know how to begin this review. This book was compelling, mesmerising, I couldn't put it down and I totally felt for Francesca (for Fray/Frankie), Jack and even Kate. Kate disappears in a tragic accident while on a beach camping trip with friends to celebrate schoolies and nothing is ever the same again. Thirteen years later Frankie is still living in the same suburb, in a dilapidated old house in need of love and attention. She is observing an auction of land next door and is taken aback to see non other than Jack and family purchase the block. It seems he is now a father to young Oli and partner to Sarah who has her own problems. Frankie and Jack fall back into their old friendship, which he initially plays down to Sarah but really, Kate is always there between them. The story is told in flashbacks from Frankie's point of view between the night of Kate's disappearance and present. The story gradually unfolds as Frankie learns and comes to know the truth of Kate's disappearance and she can finally move on. Even with the flashbacks, the story was easy to follow and Kate came alive for me when I understood the type of person she was and I felt for Frankie and Jack and all the untold truths that adults and others kept from them, which prevented Frankie having the closure she needed. I will certainly look for the authors next offering. Thank you to Random House for the eARC. I love stories set in Australia and I absolutely loved this one set is Brisbane. Although it is a Brisbane story, this should not discourage anyone from reading it if they are not familiar with this city, the scenes are well enough written that anyone can enjoy them. Our main characters were scarred by the death of Kate, the girl was her best friend and adored her, the boy was her boyfriend and suspected for her death.... Thirteen years later they meet again, by coincidence and th Brilliant book! Our main characters were scarred by the death of Kate, the girl was her best friend and adored her, the boy was her boyfriend and suspected for her death.... Thirteen years later they meet again, by coincidence and the fateful events of thirteen years prior unfold to envelope them. The plot is subtle, human and well done. This is about people and how they are left damaged by bad things in their past, how they get over them, how they move on. There is an 'expose of guilt' but that is secondary to the real plot, which is about people. I wanted to like this book more but I guessed the outcome so there were no surprises for me. Kylie Kaden is a most fortunate author to be plucked out of the slush pile and published. I've read far better books by unpublished writers. Francesca and Jack are best buddies, they grew up together. They share half a lifetime of closeness unbreakable by anyone. One school day when they were seventeen, Kate, a beautiful, lively and yet mysterious girl arrives in their class. Everyone thinks she’s hot and that includes Jack. They became an item while Kate and Francesca became best friends. One night when their group of friends went on a camping trip at the beach, Jack and Kate had a huge fight because he wanted to end their relationshi Francesca and Jack are best buddies, they grew up together. They share half a lifetime of closeness unbreakable by anyone. One night when their group of friends went on a camping trip at the beach, Jack and Kate had a huge fight because he wanted to end their relationship. She disappeared that night and the following events will lead to Jack and Francesca’s falling out. Thirteen years after, they meet again. Both have very different lives now but it seems they still haven’t come into terms with what happened before. But one thing is clear; they still have an intense feeling for each other, a feeling that has always been there and something which they never felt for the people who come and go in their lives. The entire book focused on how they dealt with inevitable truth that changed their life forever. Despite the mystery aspect of the Losing Kate, for me this is a love story all throughout. As a fan of suspense genre, this is a welcome breather for me. Despite Jack and Francesca being in their thirties already, whenever they throw their usual banter at each other, I can’t help but feel all giddy inside like I’m having a school girl crush. It’s pretty authentic the way they have this history on them and knowing each other that well. It's not bad at all how Jack is “crazy” in love with her, it is so addicting! And not to mention he’s a looker so that’s a complete package all the way! When it comes to Francesca, I get why she is reluctant to the idea of having Jack in her life again. There are so many unanswered questions and she feels she’s partly to blame on what happened to Kate. But I kind of pity her for selling herself short all these years because of that guilt. Find out if Jack will change her mind this time around. Pretty much this book is fantastic, not too many characters which I like so there is highlight on each one. There is a lot of Francesca and Jack in the pages and an adorable kid named Oliver who will melt everyone’s heart. And such a story, I just can’t get enough of it. I look forward to reading more of Kylie Kaden’s books in the near future. Goodnightcarolina is part of Losing Kate blog tour organized by Lucy Inglis of Random House Australia. I received an e-ARC for an honest review. Please check out http://goodnightcarolina.blogspot.com/ for my other posts. Schoolies week is supposed to be a time to let loose and have fun after breaking free of the shackles of high school, but for Francesca it holds only tragic memories. Camped on the Noosa North Shore with her best friend Kate and the childhood pal whom she has grown to love (Jack), Francesa's world implodes when Kate disappears one night. For Francesa it is a double tragedy - not only has she lost Kate but also Jack too. Struggling to cope with the suspicion and media attention his family abruptl Schoolies week is supposed to be a time to let loose and have fun after breaking free of the shackles of high school, but for Francesca it holds only tragic memories. Camped on the Noosa North Shore with her best friend Kate and the childhood pal whom she has grown to love (Jack), Francesa's world implodes when Kate disappears one night. For Francesa it is a double tragedy - not only has she lost Kate but also Jack too. Struggling to cope with the suspicion and media attention his family abruptly moves to Townsville leaving Kate alone and adrift without even the opportunity to say goodbye. ‘Hope I’m not distracting you from bidding,’ I laugh. ‘Are you here gauging the market then?’ I ask Jack, returning my attention to my Class of 2000 reunion for two. Behind his shoulder, I see the winning bidder hovering near the officials, staring out at the crowd. Jack turns to scan the crowd too. That’s when the lady in black smiles and waves. At Jack. And that’s when the baseball-cap-wearing boy spots him, and races over. Fresh out of a relationship with a cheating Merc-driving lawyer, social worker Frankie is desultorily doing up a weatherboard cottage in Brisbane. She is shocked to find her estranged childhood friend Jack Shaw buying the vacant block behind hers, with his partner and toddler. They quickly re-establish their intimacy, but between them always is the mystery of what happened while camping on the beach at schoolies - the night they lost Kate. Kaden's romance is a solid debut, with convincing tension in the mystery, a great sense of place, and an engaging voice. One to watch! I loved it. Refreshing style, modern story, set in Brisbane and the Sunshine Coast, Queensland. Recommended reading. Jean. Losing Kate gets your attention right from the first start and doesn’t relent until the very last page as Francesca (Frankie) Hudson’s story holds you captive. Frankie and Jack Shaw were friends from infancy until a “schoolies” camping trip in which Kate Shepherd, Frankie’s best friend, and Jack’s girlfriend, disappeared with her body subsequently washing up on the beach. This culminated in Jack’s family moving away from the town to escape the accusing eyes, and taunts of the neighbourhood, and a Losing Kate gets your attention right from the first start and doesn’t relent until the very last page as Francesca (Frankie) Hudson’s story holds you captive. A sad story in so many ways. Almost all sadness and loss caused by one person’s failure to tell the truth about an accident. Affected the lives of so many for 13 years. Resolution took a long time. Wonderful story, I enjoyed both the present time and flashbacks. The characters were fleshed out and 'real' with troubles and human frailties I could relate to. A great read! Such an enjoyable read. Once I started reading I honestly could not put this one down! Recommended to Sam Still Reading by: eARC from publisher - thank you! Thank you to Random House Australia for the eARC. Losing Kate. From the title, you may think that this book is a sad story, full of despair at someone losing the person they loved. While there are sad elements to this story, it is ultimately a tale of trust, hope and love told in a suspenseful way. It’s also a book that will conjure fond memories for teenagers of the late 1990s/early 2000s (especially Australian ones) with its references to pop culture. (Kaden gets super bonus points from me for Thank you to Random House Australia for the eARC. Losing Kate. From the title, you may think that this book is a sad story, full of despair at someone losing the person they loved. While there are sad elements to this story, it is ultimately a tale of trust, hope and love told in a suspenseful way. It’s also a book that will conjure fond memories for teenagers of the late 1990s/early 2000s (especially Australian ones) with its references to pop culture. (Kaden gets super bonus points from me for not only several references to Aussie band Powderfinger, but a scene at one of their concerts). The book opens as our protagonist Francesca (known as Frankie/Fray) is watching an auction for the land behind her small, dilapidated cottage in Brisbane’s suburbs. The last thing she expected to see was her best friend growing up, Jack. They haven’t seen each other since Kate went missing and Jack’s family moved away amidst the furore. As soon as Frankie and Jack meet, you can feel the history crackle between them, as well as something more – things left unsaid. The tension that’s set up here only increases from here on in – it’s as muggy as a Brisbane summer day. From this point, I was hooked to find out what the history is between Jack and Frankie. There was so much left unsaid, and I just knew it was going to be a good story. Their reunion is interrupted by Sara, Jack’s partner. Sara is a Class I, Grade A Horrible Person. She’s bitchy, looks down on Frankie and plays Jack for his affection and sense of responsibility to their son, Oli. Kaden has created a fantastic character in Sara as she raised my ire as soon as she appeared on the page. I felt a strong dislike to her – she’s horrible just for the sake of it, aiming to put down Frankie at any opportunity. But like all nasty characters, does she get her comeuppance? Well, you’ll just have to read and see. After Jack and Frankie meet again, the book goes into the past to their school days. This is where Kate comes in. We read about how she and Frankie became friends and Jack Kate’s boyfriend. The narrative then shifts to the disappearance of Kate from their Leavers’ (finishing high school) celebrations, camping in on an island. Interspersed between these chapters is the present day, where Frankie is becoming increasingly agitated about why Kate disappeared and her growing feelings for Jack. I think this was my favourite section of the book, as Frankie is becoming increasingly confused about everything. She’s concerned that there’s more than she knows about Kate going missing – is Jack the key? Why did she break up with her fiancé? Why doesn’t she enjoy her job anymore? It’s like she’s having a (slightly late) quarter life crisis. Nothing seems clear. I found Frankie’s sense of dissatisfaction very real and her search for the truth a compelling read. It’s hard to believe that this is Kylie Kaden’s first book. It’s well paced, action packed and the characters are easy to relate to (or dislike, in my case with Sara). The suspense is tantalisingly crafted, speeding up towards the end as we find out what really happened with Kate. My only criticism is that the to and fro between Frankie and Jack, the ‘will they won’t they’ teased a little too long for me (I may have asked my Kindle, “ARE YOU TWO EVER GETTING IT ON?”). But all in all, this was a fantastic book that held my interest from the very first page. Kudos also goes to the cover designer – that girl is definitely Kate. If you like your mysteries and sexual tension sultry and well crafted, Losing Kate is a book you should read. This review has been hidden because it contains spoilers. To view it, click here. Francesca, genannt Fray oder Frankie, lebt ein weitestgehend unaufgeregtes Leben in ihrer Heimatstadt, als eines Tages überraschend ihr Jugenfreund Jack das Grundstück nebenan kauft und mit seiner Freundin Sara & Sohn Oli dort einzieht. Fray und Jack waren als Kinder und Jugendliche eng befreundet, bis eines Tages die gemeinsame Freundin Kate spurlos verschwand und Jack verdächtigt wird, etwas damit zu tun zu haben. Jacks Rückkehr lässt Fray den „Sommer mit Kate“ noch einmal durchleben, da sie Francesca, genannt Fray oder Frankie, lebt ein weitestgehend unaufgeregtes Leben in ihrer Heimatstadt, als eines Tages überraschend ihr Jugenfreund Jack das Grundstück nebenan kauft und mit seiner Freundin Sara & Sohn Oli dort einzieht. Jacks Rückkehr lässt Fray den „Sommer mit Kate“ noch einmal durchleben, da sie ihren Tod bis heute nicht verwunden hat und auch ihre Gefühle für Jack werden wieder wach. Doch kann sie ihrem Jugenfreund noch vertrauen und wie gut kannte sie Kate wirklich? Kylie Kaden erzählt die Geschichte von Fray, Kate und Jack in zwei Handlungssträngen. Der erste befasst sich mit dem heute, in dem Fray nach einer gescheiterten Beziehung so langsam wieder auf die Füße kommt und durch Jacks Erscheinen völlig durcheinander gebracht wird. Es ist offensichtlich, dass Fray Jack nach wie vor liebt. In Rückblenden, die wie die gesamte Geschichte aus der Sicht von Fray erzählt werden, erfährt der Leser, wie die beiden jungen Mädchen sich kennengelernt und angefreundet haben. Aber auch, wie Fray tatenlos mitansehen musste, wie aus Kate und Jack ein Paar wurde. Leider hat mich die Geschichte nicht so gefesselt, wie sie es hätte tun können. Schnell weiss ich als Leser, dass Kate offenbar zu den Menschen gehört hat, die sich nehmen, was sie wollen, ohne auf die Gefühle ihrer Mitmenschen Rücksicht zu nehmen. Während Fray ihre Freundin verklärt und deren Geltungsbedürfnis mit der „Angst, aussen vor gelassen zu werden“ gleichsetzt. Ich hatte eher das Gefühl, Kate könne es nicht ertragen, irgendwann einmal nicht im Mittelpunkt zu stehen. Dadurch war sie mir auch leider nicht sehr sympatisch, obwohl sie sonst eine gute Freundin für Fray gewesen zu sein scheint. Doch auch Fray hat es mir nicht leicht gemacht: Ja, sie hat Jack geliebt und liebt ihn offensichtlich immer noch, aber muss sie das in jeder Minute und mit jeder Reaktion auf Jack den Leser wissen lassen? Ich habe mich gefragt, wie Fray früher mit Jack hat umgehen können, ohne pausenlos zu stammeln und rote Ohren zu bekommen. Ansonsten plätschert das Geschehen so vor sich hin und das spannendste war noch Saras Reaktion auf Jacks Geständnis, dass er und Fray sich besser aus früheren Zeiten kennen, als er ihr gesagt hat und er ihr auch die Geschehnisse rund um Kate beichtet. Ihr nachfolgendes Misstrauen gegenüber den zweien konnte ich sehr gut verstehen. Ansonsten war sie für mich nur der nervige Anhang, aber das mag auch daran liegen, dass sie für Fray unterschwellig die Konkurrenz dargestellt hat. Dennoch hätte z. B. das Intermezzo um Jacks Vaterschaft nicht sein müssen und lenkte nur von der Haupthandlung ab. Die Auflösung „was damals geschah“, war für Fray dann sicherlich ein Schock, manches hatte ich mir ähnlich schon gedacht, doch immerhin erklärte es einiges an Kates Verhalten. Losing Kate is an intriguing novel that tells the story of how one single, chance event can change the future and destroy the lives of a number of people. The novel opens with Francesca, a single woman age thirty who is a social worker and who lives alone. Her world is a very safe one, until Jack, a boy she knew in her teens moves into the house next door along with his partner and child. The painful history that Francesca shares with Jack soon resurfaces and it becomes very obvious that neither Losing Kate is an intriguing novel that tells the story of how one single, chance event can change the future and destroy the lives of a number of people. The novel opens with Francesca, a single woman age thirty who is a social worker and who lives alone. Her world is a very safe one, until Jack, a boy she knew in her teens moves into the house next door along with his partner and child. The painful history that Francesca shares with Jack soon resurfaces and it becomes very obvious that neither can hide from their past, or their attraction to one another, forever. Losing Kate is told through two parallel narratives, the dominant one being the present day. Selected chapters tell stories of what happened in the past and how the lives and Jack were turned around when, in their final year of high school, a charismatic young woman named Kate transferred to their school. Kate is an instant hit with the other kids, but it is Francesca that she chooses for a best friend and Jack for a boyfriend. Jack and Kate have been best friends since infancy and it is only over the course of the year, and their inability too keep up with the often demanding Kate that they realise their feelings for one another may be deeper than friendship. There are a few lies and manipulations all around as the kids try to each work out who they are and who they want to be, which climaxes in a single, tragic event when a pregnant Kate disappears and drowns and Jack finds himself shouldered with the blame. Fast forward twelve years and Francesca and Jack have barely spoken in all that time. Both have experienced (or are in the midst of experiencing,) unhappy relationships and unfulfilled dreams. Jack's partner knows little about his past, but the truth about his and Francesca's relationship, along with what really happened to Kate that night soon surfaces in some emotionally charged scenes. Quite underplayed is the brilliant way that the way that the author portrays Kate, her struggles with bipolar disorder and her ability to manipulate the people around her. Equally brilliant and underplayed is the role of Francesca's older brother Ben. I think this is where Kaden's talent lies and therefore, I feel that the author could have done more with Francesca and Jack--their characters did not come to life for me anywhere near as much as Kate and Ben did. Kate and Ben felt very real to me. While Francesca and Jack were easy for me to relate to and understand they both came across as a little boring at times--I would have liked to have seen each having more individual quirks or qualities, something that made them special and unique than good people trapped in difficult circumstances. Losing Kate is an enjoyable read, bound to appeal to fans of romantic suspense. Nach einer Trennung erwirbt Francesca, von allen Fray genannt, ein Häuschen, dass sie selber renovieren will. Als bei einer Auktion des Nachbarhauses feststellen muss, dass ausgerechnet ihr Freund aus Jugendtagen, Jack, ihr neuer Nachbar wird, wird eine alte Geschichte wieder aufgewühlt. Es geht um Kate, die im Sommer 2000 spurlos verschwand. Damals 17 Jahre jung zieht die junge und wilde Kate neu in den Ort und wird gleich Frays Freundin, wenig später kommt sie mit Jack zusammen, obwohl er eine Nach einer Trennung erwirbt Francesca, von allen Fray genannt, ein Häuschen, dass sie selber renovieren will. Als bei einer Auktion des Nachbarhauses feststellen muss, dass ausgerechnet ihr Freund aus Jugendtagen, Jack, ihr neuer Nachbar wird, wird eine alte Geschichte wieder aufgewühlt. Es geht um Kate, die im Sommer 2000 spurlos verschwand. Damals 17 Jahre jung zieht die junge und wilde Kate neu in den Ort und wird gleich Frays Freundin, wenig später kommt sie mit Jack zusammen, obwohl er eine besondere Beziehung zu Fray hat und Fray in ihn verliebt ist. Trotzdem bleiben die Mädchen Freundinnen. Als eines Tages Kate dann spurlos verschwindet, fällt der Verdacht auf Jack, selbst Fray ist ihrem Freund gegenüber misstrauisch. Daraufhin verlässt Jacks Familie zusammen mit Jack den Ort. Als die beiden Freunde, Jack und Fray, nach so langer Zeit aufeinander treffen, kommt der Sommer mit Kate wieder hoch und Fray beginnt nach und nach zu rekapitulieren, was damals wirklich geschah. Als erstes muss ich sagen, dass ich das Cover zwar hübsch finde, es aber nicht so unbedingt zu der Geschichte passt, ich habe hier, nur vom Cover ausgehend, eher einen schnulzigen Roman erwartet, doch zu der Liebesgeschichte gesellt sich auch noch ein wenig Krimi und Spannung, vor allem im letzten Teil des Buches. Erzählt wird das Buch aus verschiedenen Blickwinkeln, sowohl in der Gegenwart, als auch in der Vergangenheit und dann auch noch aus der Sicht der Charaktere. So bekommt man einen guten Eindruck über die Protagonisten und deren Handlungen und so nach und nach entsteht ein fertiges Bild, was damals wirklich geschah. Leider wird die Geschichte dadurch aber auch ein wenig holperig und gerade auch am Anfang etwas langatmig, gerade weil die Rückblicke auch nicht in chronologischer Reihenfolge erzählt werden. Es hat ein wenig gedauert, bis ich mich auf die Geschichte einlassen konnte, doch ab ungefähr der Mitte des Buches wurde es besser. Der Schreibstil der Autorin ist flüssig und lässt sich problemlos lesen. Fray ,die Protagonistin, mag ich recht gerne. Sie ist eine liebenswerte Person, mit einigen Selbstzweifeln. Sie besitzt einen Humor, der mich das ein oder andere mal zum Schmunzeln brachte. Auch die Nebencharaktere sind gut dargestellt und man bekommt von den einzelnen Personen einen guten Gesamteindruck. Alles in allem ein netter Unterhaltungsroman, der mich am Anfang noch nicht ganz packen konnte, jedoch an Tempo aufnehmen konnte und mich dann auch gut unterhalten hat. Ein Buch, das genau richtig ist, für einen sonnigen Nachmittag im Liegestuhl. Keine große Literatur, aber ein liebenswertes Buch, für zwischendurch. Ich schwanke in meiner Bewertung zwischen drei und vier Sternen und würde am liebsten 3,5 lieb gemeinte Sterne für dieses Buch vergeben! Der Roman "Der Sommer mit Kate" von Kylie Kaden ist 2015 im Ullstein Verlag erschienen. Dabei handelt es sich um einen Liebesroman, in der sich die Protagonistin mit ihrer Vergangenheit und somit auch mit einem Unglück aus ihrer Jugend auseinandersetzt, das ganze spielt in Australien. Francesca ist Ende Zwanzig, besitzt ein renovierungsbedürftiges Haus und arbeitet als Sozialarbeiterin in einem Krankenhaus. Seitdem ihr Ex-Verlobter sie betrogen hat, konnte sie sich nicht neu binden und die einzi Der Roman "Der Sommer mit Kate" von Kylie Kaden ist 2015 im Ullstein Verlag erschienen. Dabei handelt es sich um einen Liebesroman, in der sich die Protagonistin mit ihrer Vergangenheit und somit auch mit einem Unglück aus ihrer Jugend auseinandersetzt, das ganze spielt in Australien. Francesca ist Ende Zwanzig, besitzt ein renovierungsbedürftiges Haus und arbeitet als Sozialarbeiterin in einem Krankenhaus. Seitdem ihr Ex-Verlobter sie betrogen hat, konnte sie sich nicht neu binden und die einzige Freundin, die sie regelmäßig sieht, ist ihre Nachbarin Meg. Eines Tages wird das leere Grundstück nebenan versteigert und unter den Bietern befindet sich ihr ehemals bester Freund Jack Shaw, den sie seit Jahren nicht mehr gesehen hat. Schnell wird klar, dass er nicht allein gekommen ist, sondern mit Sohn und Freundin, um das Grundstück zu erwerben. Mit ihm kommen nicht nur die alten Gefühle wieder zurück sondern auch Erinnerungen an eine Freundin namens Kate. Wie Francesca und Jack nun miteinander umgehen, wie ihre Beziehung sich früher gestaltet hat und was es mit Kate auf sich hat wird mittels unterschiedlicher Zeitsprüngen erzählt. Der Schreibstil ist geschmeidig, lässt sich angenehm flüssig lesen und ermöglicht es einen sich die Geschichte vor der Kulisse Australiens bildlich vorzustellen. Die Charaktere sind verschiedenartig, wirken jedoch an mancher Stelle stereotypisch. Francesca ist ein moralischer Mensch, der sich oftmals selbst im Weg steht, was sie jedoch echt wirken lässt. Und womit sich wohl fast jeder zumindest etwas identifizieren kann. An dem Spannungsbogen hätte noch gearbeitet werden können, ich habe so manche Geschichte aus früheren Zeiten als Längen empfunden und hatte nicht das Gefühl, dass es mit der eigentlichen Geschichte voranging. An sich birgt das Buch keine neuen Ideen, jedoch habe ich noch keines gelesen, dass diese Thematik innehält. Ich fand es durchaus interessant und mutig von der Autorin. Insgesamt habe ich das Buch gerne gelesen, für mich wiegt die Geschichte und der Schreibstil die Längen wieder auf. Es ist in mancher Hinsicht vorhersehbar gewesen, was bei solch einem Roman aber häufig der Fall ist. Fray und Jack sind zusammen aufgewachsen und die besten Freunde. Als Kate auftaucht und Jack ihr nach und nach verfällt, leidet die Freundschaft und die aufkommenden Gefühle darunter. Nicht scheint wie früher. Als Kate bei einem gemeinsamen Ausflug auf mysteriöse Art verschwindet, bricht diese Freundschaft auseinander. Nach über dreizehn Jahren treffen Jack und Fray erneut aufeinander. Wie hat sich das Leben der beiden verändert und hat ihre tiefe Freundschaft noch eine Chance? Die Spannung in diesem Roman von Kylie Kaden zieht sich wie ein roter Faden durch das gesamte Buch. Selten fesselt eine solche Geschichte mich bis zum letzten Satz. Die Protagonisten sind detailliert und authentisch. Fray ist das hübsche, unscheinbare Mädchen, das für ihre beste Freundin alles tut und dabei sogar auf ihr eigenes Glück verzichtet. Ihre Gefühle sind so gut nachvollziehbar und gerade deswegen konnte ich nach nur wenigen Seiten eine Verbindung zu ihr aufbauen. Auch Jack ist mit seinen Fehlern und Charakterzügen sehr sympathisch. Als typischer Macho wickelt er jede Frau um seinen Finger. Die Zeitsprünge im Buch gefallen mir sehr gut. So erfährt der Leser nach und nach was in diesem Sommer passiert ist. Welcher Mensch Kate wirklich war und wie falsch Fray mit ihren Mutmaßungen lag. Diese Nebengeschichte kann als kleine Kurzgeschichte empfunden werden, die sich passend in die Kapitel einschleicht. Der Roman zeigt, wie sehr die Vergangenheit unsere Zukunft beeinträchtigt und wie sehr wir darunter leiden, wenn wir nicht mit einzelnen Situationen abgeschlossen haben. Diese ausgeklügelte und schwierige Handlung macht das Lesen zu etwas besonderem. „Der Sommer mit Kate“ ist ein schönes, spannendes und zugleich prickelndes Buch. Der fließende Stil der Autorin macht diese mit Leid und Schmerz gezeichnete Geschichte zu einem Lesevergnügen. Auch wenn das Ende vorhersehbar ist, wird es den Leser an so manchen Stellen überraschen. Leseempfehlung! Fray wohnt allein mit ihrem Hund "Bear"in Brisbane, das Haus, das sie bewohnt, hat sie vor etwa einem halben Jahr gekauft und ist dabei, es zu renovieren. Das schmale unbebaute Nachbargrundstück wird zufällig an ihren ehemaligen Jugendfreund und Schulkameraden Jack verkauft. Er hat mittlerweile einen 2-jährigen Sohn und eine Freundin. Er benimmt sich aber reichlich komisch zu Fray, da er sie nicht einfach seiner Freundin Sara vorstellt, sondern erst mal verschweigt, dass er sie kennt. Ein paar W Fray wohnt allein mit ihrem Hund "Bear"in Brisbane, das Haus, das sie bewohnt, hat sie vor etwa einem halben Jahr gekauft und ist dabei, es zu renovieren. Das schmale unbebaute Nachbargrundstück wird zufällig an ihren ehemaligen Jugendfreund und Schulkameraden Jack verkauft. Er hat mittlerweile einen 2-jährigen Sohn und eine Freundin. Er benimmt sich aber reichlich komisch zu Fray, da er sie nicht einfach seiner Freundin Sara vorstellt, sondern erst mal verschweigt, dass er sie kennt. Ein paar Wochen nach dem Grundstückskauf steht das Fertighaus bereits, und Fray's Nachbarn ziehen ein. Sara gibt sich ziemlich zickig, und Jack macht nach wie vor ein Geheimnis daraus, dass er Fray viel besser aus seiner Jugend kennt, als er Sara erzählt hat. Das Buch wird in zwei Zeitschienen erzählt. Zum einen in der aktuellen Zeit und dann gibt es zum zweiten Rückblenden, die meisten davon erzählen aus dem Jahr 2000, als Kate ins Leben von Jack und Fray trat. Die Rückblenden sind auch gut als solche erkennbar, da sie in einer anderen Schriftart gedruckt sind als die aktuellen Ereignisse. Kylie Kaden erzählt ihr Buch aus Sicht von Fray. Die beiden Hauptprotagonisten waren mir von Anfang an sympathisch, der Schreibstil hat mich sofort in die Geschichte hineinversetzt. Mit Kate hatte ich so meine Schwierigkeiten, sie war mir ein bisschen zu "abgedreht", aber da ich im Verlauf des Buches immer mehr über Kate erfahren habe, da habe ich sie dann auch etwas besser verstanden. Kylie Kaden hat ein tolles Buch geschrieben, das ich nur ungern aus der Hand gelegt habe, es hat mich bis zum Schluss sehr gut unterhalten. Der Mix aus Freundschaft, Liebe, Krimi und Drama ist gut gelungen, ich werde das Buch auf jeden Fall weiterempfehlen und vergebe 4 von 5 Sternen. Hi there, and thanks for taking the time to pop by. Writing is an isolated occupation, so feel free to drop me a line! Okay, writers make the stuff up, but the stories only come to life when they get let out into the real world. It is the readers that breathe life into characters, and the readers who I hope to connect with. I'd love to hear your thoughts! (or www Hi there, and thanks for taking the time to pop by. After postgraduate study, Kylie went on to train and manage staff in both the corporate and government arenas, where she met her surfer/lawyer husband at an end-of-year function (at the pub). She wrote her debut novel,Losing Kate whilst on maternity leave from an executive role in the Australian Public Service.